"Shopping local" is a phrase that is permeating our culture, one may even say it's what the hip kids are doing these days. We all know shopping local is probably a good idea, but why exactly is it so great? Does it really make a difference? We’ve talked to a couple local Calgarian experts to find out exactly how choosing to shop locally impacts our community. First, we talked to Stephanie, the founder & director of Respect for the Earth and All People (REAP). REAP is a network of 150 Calgary area businesses that believe in the power of business to create more good. REAP businesses promote the benefits of being local, educate Calgarians about the local options in our city and support each other to increase economic and social impact. Stephanie began her career in marketing but grew tired of accepting the typical “capitalist trade-offs” of running a business. To show the community that more conscientious ways of operating were possible, and also profitable, she started REAP. Stephanie says that choosing a local business over a large chain doesn’t just feel good, it creates a tremendous amount of economic impact. As mass production and the homogenization of culture pervades our generation, we can reconnect with our “place” by supporting local. Local services and products reflect the lives of the people in your community, are able to be more transparent in their production practices than big brand businesses and can provide personalized service through direct connections with their customers. To find local businesses, Stephanie suggests visiting belocal.org, where you can find a directory of businesses in the REAP network. We also connected with Myra, a local entrepreneur, to hear about her experience as a local business owner. Myra is the inspiration & owner behind the recently opened Velour Clothing Exchange. Through running this local business, Myra has learned first hand the circular support of shopping local. When people buy from Velour Clothing Exchange, Myra can pay a living wage to her local staff who can then also spend the money locally. She can also use her shop to sell and promote local artisans and events. In opening Velour, Myra has seen how local shops work together to support each other, which strengthens the community. Being able to meet your customers and other business owners has shown her the wealth of generosity and diversity in the Calgary community. When shopping at Velour, the customer can get to know Myra, receive her expertise while shopping and be inspired by her passion for vintage clothing! When was the last time you could call the owner of your favourite retail store your friend? You can do more than shop to support local businesses! 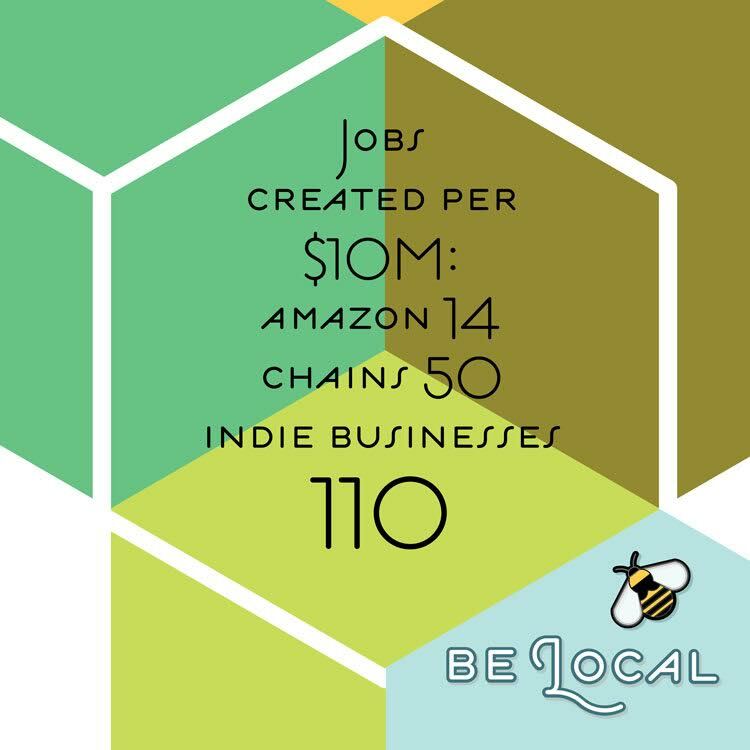 Share content about inspiring local products or initiatives with your family and friends. Follow REAP on Facebook, Twitter and Instagram for inspiration! Vote in REAP’s annual Be Local Awards each summer to help choose Calgary’s favourite local businesses. Subscribe to REAP’s weekly newsletter to get in on the action and be notified when voting opens. Canada’s biggest local economy conference is coming to Calgary in September! Visit EconoUs for details on local tours and workshops that will get you connected with the best Calgary has to offer. Attend community events! REAP’s upcoming Down to Earth Week festival of social innovation and local business from April 23-27, 2017 is a great place to start. Also check out The Clothing Bar, Market Collective and Avenue Calgary for events that promote local love! Are you passionate about supporting local? We'd love to hear about some of your favourite local businesses!